A long week of meetings last week... good meetings, mostly. Some of them were great. But that doesn't stop the nervous doodling. 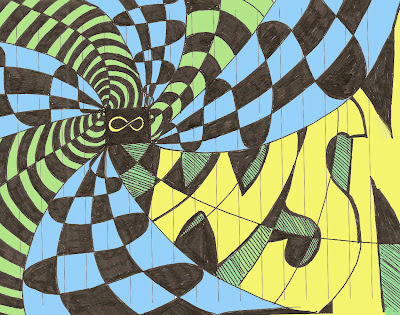 Here's one of the three doodles from last week I feel are worthy of sharing at BHR. It's called "WSN FOREVER!" I've been asked to be in a radio interview next week. I'll give you details when I know when it will be broadcast, but someone contacted me to ask if I could talk with them about the "Disarming Questions" article in Discipleship Journal in the Jan/Feb issue. We're doing the interview next week, and then they'll take a week to edit it and make me sound all smart and stuff. At least I hope so. Krista: I can't sew very well. And your Dad isn't even interested in sewing, he'll probably never learn to sew. A (horrified): You mean that for the rest of his life he'll have to buy his clothes? 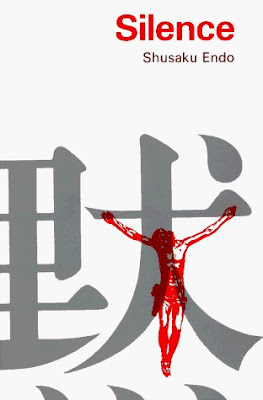 After World War II there was a sudden surge of quality Christian art and literature in Japan. As the fuedal system collapsed many from the samurai class abandoned their traditional beliefs to follow Christ... in fact, most of the earliest believers following World War II were samurai class. Many of the artists from this time have become some of Japan's most revered 20th century artists. One of the best respected of these was a Catholic novelist named Shusaku Endo. I've been reading Endo's most famous novel, Silence, this week. It takes place in the 16th century during a time of brutal oppression for the Christians. Father Sebastian Rodrigues hears word that his old teacher, a missionary in Japan for the last thirty years, has abandoned the faith rather than accepting a glorious martyrdom at the hands of the Japanese government. Disturbed by this report, he and two other priests set out on the harrowing journey to a nearly inaccessable Japan, determined to learn the truth. It is an amazing book. I've just passed the halfway point, and already this book haunts me, and has given me a clearer picture of suffering and persecution, faith and discipline. There are scenes of peace with a strange clarity in the midst of the destruction all around Father Rodrigues, and a Christ who speaks softly in the midst of the apparent silence of God in Japan. I'm looking forward to the end... I'm going to go read it right now. A really interesting post about Atlantis showing up in google earth. Check it out. My friend Shasta and I were driving by a lake today and we saw an alligator swimming in it. 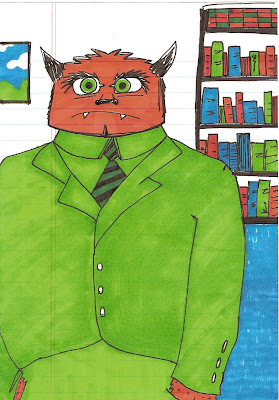 He was trolling along through the center of the lake, his big reptillian tail swishing along behind him. We decided we needed to take a closer look, so we came back a little later and went on a hunt. We walked along the edge of the lake, but we couldn't find it. There were little bubbles rising every once in a while and Shasta looked for rocks to throw to see if we could get it to rise. I started getting a little creeped out because the thought of a muscular eight-foot lizard rising out of the water and snapping at us can creep a guy out. We decided to walk around to the other side of the lake. We saw some big weird birds that could barely stay up in the branches of the tree they were roosting in. I figured if they fell in the water we might see some Animal Planet action. As we were about to give up, we walked along the last bit of the lake and there it was, right up near the edge, its eyes and snout sticking up from the water. I went up to get a good look at it and Shasta started assuring me that it would eat me. She didn't want to throw rocks at it anymore. Our friend says that the distance from its eyes to the tip of its snout in inches equals its length in feet. If that's true it's about twelve feet long. I thought it might be eight feet long, though. The frightening thing about an alligator, besides the muscles under that scaly armor plating, is the eyes. The gator had a dispassionate look, like it had weighed me and didn't matter if I lived or died, like I might look at a plate of raw meat I was about to put on the grill. I could see the flick of the eyelids sliding over the eyes and back. I could see its heavy jowls under the water. We walked past it and back around the lake. Shasta said I was too close, but I noticed that I wasn't attacked or harmed in any way. Which would argue that I wasn't too close. I think we're going to take some friends to see it tomorrow. I had a dream early this morning that I lived in a house with a bunch of guys, and I was getting ready to take a shower and one of the guys got in before me, so I was standing there in my towel just really angry at him. And then the other guys all would steal my turn in the shower and I was getting angrier and angrier until I woke up. I was still mad. I calmed down and then went back to sleep. Now my roommates had invited a bunch of their friends over for karaoke and I was trying to sleep. I started yelling at them GUYS KNOCK IT OFF but they wouldn't stop and then I woke up again. I found this interesting... a father was concerned about his son playing a first person shooter game, so he told his son he can play the game... but he has to follow the Geneva Conventions. Read the Dad's write up about it here. And links to the Geneva Conventions on wikipedia. My friend Sam sent me a note telling me about a great honor that she and her boyfriend have blessed me with. 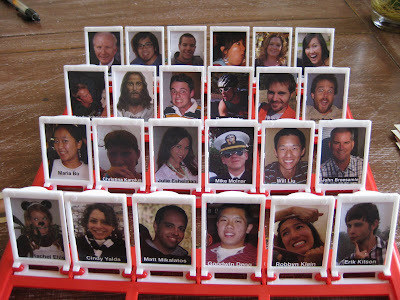 You may recall the game "GUESS WHO" (pictured at left). In the game, you and your opponent have the same gameboard but can't see each other's cards. You opponent draws a card with a character's face on it and you have to guess which card they hold by asking them questions. "Is it a man or woman? Are they wearing a hat? etc." Sam and her boyfriend decided that this game wasn't enough fun, so they made their own board with the faces of people they know. Please study the following board and see which of your friends are included. I think you'll like some of the surprising people included in the picture below. 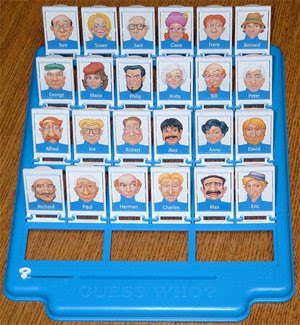 Unfortunately, it's too easy to find out if I am the card chosen in the game, as the player has merely to say, "Is this person a swarthy Greek?" If the answer is yes, it's me... as you can see from the picture to the left. Be sure to leave comments about the people you know in the picture. I spoke last night at the "Fish" meeting at University of Portland, a Catholic university here in Oregon. It's a student run meeting associated with Campus Crusade and run with the blessing of the university. We had a great time. I was really impressed with the students, who told me their theme for the semester ("a faith worth sharing"), their mission statement ("becoming fishers of men"... thus the name Fish), and the scripture they wanted me to teach from (Acts 10... Cornelius and Peter). There were about 70 students and they are doing lots and lots of things right... they are friendly, worship-focused, Christ-centered and interested in helping others hear about Christ. They partner naturally with others... they are moving the meeting next week (Ash Wednesday) so that people can go to mass if they like, they are promoting a guy coming to speak at another church this weekend, they had in me from CCC and another couple guys from a Christian Outdoors ministry who were looking for summer staff... and they're planning their own retreat, and they are putting together a team for a "Run for Life" event (and so on and so on). All in all I was really encouraged. We met a few months back with one of the UP staff, and she told me that at various gatherings of Catholic schools they brag about what a strong, healthy relationship they have with this Inter-denominational organization, Campus Crusade for Christ. And I want to brag about them, too... it is a pleasure to work with the UP staff ministering together to these students. And the school is so generous to the Fish students... even supporting them financially when they go on CCC mission trips and conferences. Amazing. All that to say... praise God that we can work together and help point one another toward Christ and greater devotion to Him. I have been trying to explain to you gentlemen for some time that a quick way to make some points with the ladies is to watch some version of the movie Pride and Prejudice. Many of you have not heeded my advice. I'm sure this is because the amount of dedication required to watch a movie that is all about relationships, misunderstandings, slavish devotion, imperiled love and the weird girl getting her man is a little too much for you. Never fear, a new (slightly edited) version of Pride and Prejudice is now available, which will allow you to dazzle your woman. Now you can read... Pride and Prejudice and Zombies: The Classic Regency Romance - Now with Ultraviolent Zombie Mayhem! Note: Please be aware that when your special lady cuddles up against you and asks, honey, what was your favorite moment in Pride and Prejudice? that the correct answer is NOT When Mr. Darcy bit Mr. Wickham in the face. You have been warned! I have this unstoppable desire to doodle during meetings. I'm engaged and paying attention, but my hands need something to do while the rest of me is in the meeting. I was in meetings all last week, and here's my favorite doodle from that time. As near as I can tell this monster is about to go on a first date and he's nervous. I'm working on the research for my Church History report in about a month. I have permission from my professor to study the use of fiction and story by Christian authors to create change in the culture around them and point people toward Christ. The catch, of course, being that I can't use European or Western authors. Which removes large chunks of the more familiar Christian literature (which is, I am sure, precisely the point). Silence by the famous Japanese Catholic author, Shusaku Endo. I'll also read Things Fall Apart: A Novel by Chinua Achebe, the "father of modern African writing." As well as At the Master's Feet by Sadhu Sundar Singh, the famous Indian mystic who converted to Christianity after seeing a vision of Christ. I'll be paying special attention to his parables, and in fact you can read a book that has some samples of his work in Wisdom of the Sadhu, which is available as a pdf for free online. I think you'll find it interesting. HERE'S THE PROBLEM and why I need your help... as you may have noticed, all three of these authors are from the 20th century. I've been working on finding some pre-20th century, non-western, Christian authors who use fiction, story or narrative in their work. I am certain some of you out there can help, so I am planning to use you as a sort of Monstrous Hive Mind to give me some direction. So leave a comment if you've got a thought... thanks! I hereby release all SafeWay checkers from their responsibility to attempt to say my last name when I go through their line. This applies to people who attempt to disguise their uncertainty about my name's pronunciation by slurring it while dropping their voice and turning away... like so... "Thank you, Mr. Mikulphruggig." This applies, likewise, to the people who boldly pronounce a mutilated version of name, making certain to catch my eye and dare me to correct them... like so... "Thank you, Mr. Mike-Al-Ay-Toast. Did I say that right?" This also applies to those who look at the receipt, see my name and say, "Thank you, Mr.... how do you say your name?" STOP ASKING! OBVIOUSLY I DON'T KNOW! It's Greek for crying out loud, and I am an American. Your guess is as good as mine. In conclusion, from now on feel free to call me "Mr. Matt" or "Mr. Mik" or even to say, "Thank you, sir." Sometimes you can't answer a question as simple as "What's your name?" My daughter A has this habit of making up words. She likes to call me "Dewey." It originally started as Dad, Daddy, Doody, and eventually became Dewey. Or maybe Dooey. Not sure on the spelling. Anyway, she also likes to say in a sort of singsong chant, "Hi, Dewey, what's your name, Dewey?" And you think the correct reply would be, "Dewey." But you would be wrong. The correct response is, "IIIIIIIIIIvvvyyyyyyyy." I can never remember that this is what I am supposed to say. So she has to coach me. A: Hi, Dewey, what's your name Dewey? A: That's right, Dewey! And do you know what Ivy means? A: And in English it means a type of plant. There's a new website that I think all of you BHR minions will find enjoyable and probably want to join. It's a project where people are encouraged to leave little notes and bookmarks in publicly accessible books. You know, like library books. Some of them are pretty funny. Like this note in Lord of the Rings and this one in Decline and Fall of the Roman Empire. You may recall the Christian literary magazine, Relief and its terrifying spin-off Coach's Midnight Diner. I've been helping out with a little editorial work here and there. You can see my official bio here. I bet you'll learn something new about me if you read it. Or maybe you already knew about that. I'm sure some of you expected the truth. Once there was a girl that was very poor. She went to school with all the other girls of the neighborhood just like any other girl. One day a girl asked her how many horses she had. In the time she lived everybody had at least one horse. And she answered, "I have twenty horses of every kind." Now one other girl was poor. She said, "Now can't you see that she's lying?" But all the other little girls thought that the poor girl actually had twenty horses of each kind! The other poor girl thought that the other girls might start asking her how many horses she had and she would be embarrassed to say that she only had one horse and that horse was a carriage horse and he belonged to the whole family. The other poor girl's best friend was not poor. She was not rich, either. She was just like you or me. Every day she rode a beautiful thoroughbred horse to school. Everybody thought that the thoroughbred horse was the most beautiful horse ever. But the poor girl insisted that her Thoroughbred horse was the beautifullest thoroughbred horse ever. But everybody called her names. So one day they packed up and left. Z told me on Friday that she is planning to make a unicorn. Me: How will you accomplish this? Z: By breeding a horse with a rhinocerous. Me: You think that will work? Me: Why don't you just attach a horn to a horse? Z: Because it will fall off and everyone will know that it's not a unicorn. No animal has a horn exactly like a unicorn. Me: The narwhale has a horn that looks a lot like a unicorn. Z: I will breed a horse and a narwhale to make a unicorn. Me: How will you do that? Z: I will get a giant tank of water, and stable the horse next to the narwhale. Then I will put a paper cutout of a heart on the tank, so that whenever they look at each other they will think they are in love. Me: What if, instead of a unicorn, you get a whale with horse legs? Z: I will still be famous, because I will have made an animal that can walk on land and swim in the sea. Kyle the Bad Alley Cat. Walking Z to school this morning I found three crumpled, abandoned packs for cigarettes. I knew immediately who had done it. Those three strange cats who have been hanging out on the corner. Past experience tells me that one of the more innocent neighborhood cats will soon have a litter of kittens. Brennan, the terror of South Neighborhood. Also walking Z to school this morning, a large dog from the neighboring neighborhood came barreling out of nowhere, sniffing our shrubbery and then barking barking barking at me and Z. It came close and growled, baring its canine teeth (I guess all of its teeth are canine teeth) at us. A woman in a car drove up and started yelling BRENNAN KNOCK IT OFF! BRENNAN GET IN THE CAR! which sent him into a wild flurry of running between the fifteen different people converging on the school to bark threateningly at them. She eventually wrestled that monster into her car. Z was frightened, but I told her the dog had been after me. Because he was trying to take over my kingdom. Well, it's more of a fiefdom, but nevertheless. I'm not the sort to barge into someone else's neighborhood and bark and bark when I am attempting a coup, however. I will say this... Sir Brennan, when next we lift dog bowls together you had best taste the draught within to make sure there is no bitter flavor. Hint, hint. Good Morning, Neighborhood. The sun lifted carefully over the neighborhood today, as if being cautious not to fall on us. She gently turned the ice to steam, and turned the steam from the fenceposts golden. I had the feeling that the whole earth was stretching and sleepily looking around with an ineffable sadness, the sadness that comes from seeing too much beauty in small pieces of the creation and realizing that this is not enough, that there is a deep well within yourself wanting much, much more of it. It's the sort of realization that makes you see a man on the highway with his car broken, the green hills rolling off behind him and you think, He's going to have a good day. He's going to put down his phone and wait for the tow truck and realize, look! How beautiful the hills are... and if my car hadn't broken down, I would have never stopped to see it. It's the kind of day that makes you stand up from your desk and walk outside and wonder, is the whole world this beautiful? Is all of creation dressing herself in muted splendor, just wondering if we'll notice? Look out your window, friend. It can't only be my neighborhood. It has to be out your window, too, I'm sure of it. Tonight after an excellent meal of pizza from the Blind Onion -- Krista ordered us a pizza with olive oil instead of tomato sauce and it was excellent -- I threw the cardboard box into the garage to break it down for the recycling. Something about the way I threw it down the one step into the garage reminded me of a wrestler falling in the ring. So I thought, hey, I'll leap in the air and stomp on it. Like a wrestler. So I threw myself into a monstrous parabolic arc, my feet pointed like jack hammers at the cardboard. It gave no resistance as my soles broke it into two dimensions. And then the cardboard began to slip forward. Causing me to lose my balance and slide backwards, my head now headed for the thick metal door behind me. It flashed through my mind that I was about to smack my head into either the door or the step, and that my skull would crack open like a ripe watermelon on a rock. It was a lousy way to go, but at least the box would get recycled (I try to look on the bright side of things). "THIS ONE'S FOR YOU, MOTHER EARTH!" I thought but could not say aloud. Then I regained my balance. So where the heck is it? Moral of the story: Don't let butterflies near your babies. Or any queens you happen to know. Also... GREEDY BUTTERFLIES! LAZY BUTTERFLIES! BAD BUTTERFLIES! I would try to catch you to spank you but your crazy loopy-dee-loop leaf falling flight makes you too hard to catch. NEXT TIME, SNEAKY BUTTERFLY! NEEEEEXT TIIIIIIIME! Trouble Brewing. Yesterday morning I woke to find not one, not two, but three cats on my front porch. Which is mystifying as I own... zero cats. The black and white cat (which has more toes than is natural) was staring with undisguised malice at the fat grey cat. The sentiment was mirrored precisely. The white cat with the brown face lounged indolently nearby with a practiced look of indifference. Since that moment they have been taking turns watching the house. Right now the Many-Toed One is sitting by my back window with Miniature Tiger. One of them is watching the bird feeder, and one watching the house. I'm getting nervous. Leader of the Pack. VROOOM! The Beautiful Ukranian Girls next door took out their bicycles yesterday, but they had the saddest looks on their faces. I quickly diagnosed the problem. "You're wishing your Mom hadn't sold your tiny motorcycle, aren't you?" They both immediately chimed, "YES!" Spring Has Sprung. The ridiculously warm weather of the last week or so has been a nice counter-point to the bizarre and unending winter around Christmas. The first spring bulbs are sticking their pointy green heads out, looking around for summer. The confused ducks and geese of the Willamette Valley continue to fly east and occasionally west. There's some sort of exchange program going on, I'm almost certain. I have these new jeans that are cut like slacks. What I mean is, instead of having pockets in which your hands enter from above, these jeans have pockets like slacks, in which the hands enter horizontally. Also, the jeans have a button fly. What this means is that I often try to put my hands in my pockets, but through force of habit I end up trying to put my hands in regular pockets and I end up rubbing my thighs. Then, after I use the bathroom I button up and after buttoning up I then try to zip up also. Which is just confusing. Which brings me to the question... Do I change my pants often enough? Let's start off by admitting that the picture on left is totally ripped off from the Fiction Family blog. The pictures that Krista and I took were more, um, artistic. But the smears of color were certainly beautiful. Yesterday was one of those days where it seems like everything goes right. I took seven-year-old Z in for an MRI and she performed well, looking at the doctor in strained disbelief when he kep asking her if she was scared. "Why should I be scared?" she asked. She appeared to have fun and told me she almost fell asleep during it (Doc says all is well and nothing to worry about). Then Krista and I met up and went into Portland where she had a couple of appointments, and I worked, with a brief break in a sunlit park to eat a street food burrito. Then we checked into a ridiculously fancy hotel that is having a sale because of the economy, so the overall price was about how much it costs to keep our house warm overnight. We grabbed some Lebanese food and then headed over to the Aladdin theater to see Fiction Family! Molly Jenson opened the show. She did a fine job, she has an easy way of interacting with the audience and setting us up for what would come later. Sean Watkins came out and joined her on one song, and she ended her set with "You Are My Sunshine" which involved perhaps the funniest moment of the night when the sound/light guy made a shining sun appear on stage behind her and we all burst into laughter while she tried to sing the song in a serious, mournful way. She made good sport of it and we had a big sing along. Then our fictional family took the stage, and I will say that the whole concert had a bit of the feeling of a very talented family hanging out together and doing an impromptu talent show. "Jon-boy, go get your banjo!" Krista and I were talking last night and we both admitted that this show was better than the last Switchfoot show we went to (I KNOW... sacrilege... put down those rocks, my friends, do not kill me over this brief lapse). It was just fun, and you could tell the musicians were having fun, too. They sang some FF songs (this is from memory and not in order, folks... When She's Near, War In My Blood, Closer Than You Think, Betrayal, Throw It Away, Mostly Prove Me Wrong, and one they haven't recorded yet that made me laugh out loud and sit there with a goofy grin on my face called, I think, Rob Me or something along those lines). Sean sang a couple of songs as well, and (special treat!) his sister Sara was there, too, and they sang one of the best of the Nickel Creek songs, Somebody More Like You. Jon sang Resurrect Me and also Your Love Is Strong. 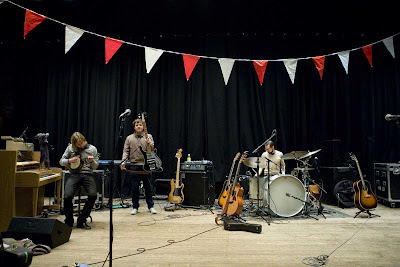 the whole gang also teamed up for a fascinating, stripped down version of Radiohead's Idioteque. Overall, it was a great mix. The Watkins siblings are superior musicians, and watching Sean play guitar was amazing, and of course Sara is ridiculously good on the fiddle. And Jon's vocals are always exceptional. I'm interested to see how this all plays out on the next Switchfoot album, as it's pretty clear that Jon is picking up some tricks from Sean. It was a concert that made you feel good. It was a concert where you walked away thinking, it was fun to sit there and listen to my friends make music, and sing along and have a little conversation, and you were sad at the end of the night to say goodbye and it felt almost rude to walk out the back door instead of hanging around to say good night to all your friends on stage. So goodnight Jon, Sean and Sara... and yes, Drummer Guy and Bass Player, Jon never introduced us but I assume we would be friends also. Good job everyone, and I hope that the next time you all are in Portland you'll stay with Krista and I. She'll get out her guitar and A will play piano and Z will sing and I will stand around with a goofy smile on my face or something. I mean it... you guys better call us. Apparently some people have problems with co-workers stealing their lunches out of the fridge. 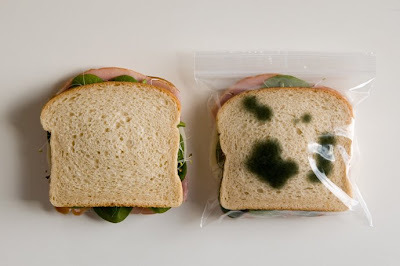 So the fine folk here have come up with plastic baggies designed to make it look like your sandwich is moldy. Which of course means that your co-workers will throw your lunch in the trash. But at least you'll know where it is. As for me, I like to forget my things in the fridge and get real mold on them. Then I tell my co-workers, "Oh, no, this is not really moldy, it's a fake plastic baggie that makes it appear moldy. Why don't you take it home with you? Oh, yes, I'm sure you'll love it." I am very popular around the office. Z: How many chucks would a woodchuck chuck if a woodchuck could chuck wood? Me: I don't know. How many? Z: Why would I ask you if I knew the answer?